Exciting new venue this year! Stroll about Andiamo while tasting wine pourings from six selected Michigan wineries and enjoying Andiamo appetizers specifically made for the evening. The evenings wines will be presented by Bel Lago, Black Star Farms, Brys Estates Vineyard & Winery, Forty-Five North, Hawthorne Vineyards and Laurentide. The entire restaurant will be made available to event patrons with convenient parking. Tickets: $45 ($55 at the door), purchase using the QR code (link above) or by contacting a Clarkston Rotarian. For additional information or tickets call 248-625-9741. Auction items & a 50/50 drawing benefit Clarkston Rotary's commitment to community and international service projects. A SAVE THE DATE flyer is available under downloads. 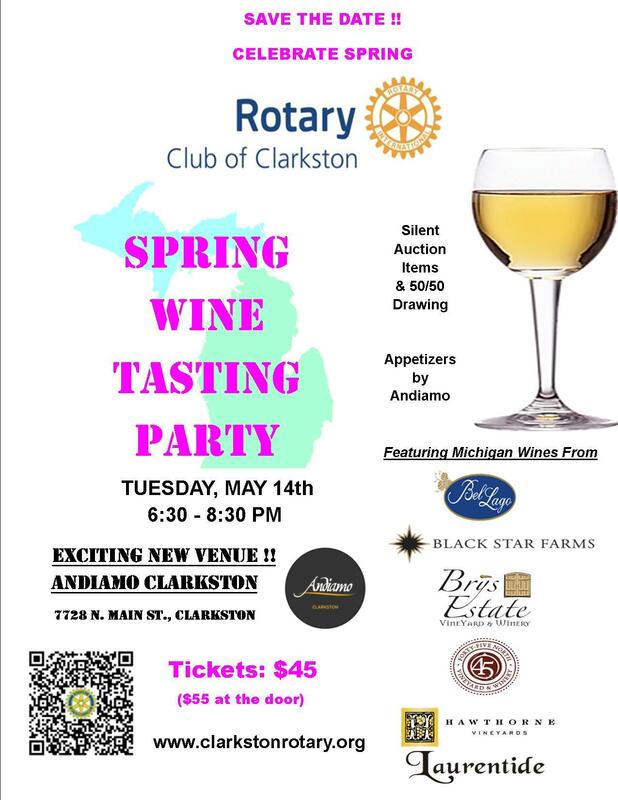 Join us at Andiamo in Clarkston on Tuesday, May 14th for tastings from 6 selected Michigan wineries, appetizers by Andiamo, auction items and 50/50 drawing. Wines will be available to purchase by the bottle or case. The entire restaurant will be made available to event patrons.